A roasted cauliflower and mushroom pasta in a creamy egg and bacon sauce seasoned with plenty of fresh cracked pepper. Carbonara is an Italian pasta dish consisting of egg, bacon, fresh cracked black pepper and cheese and I am a huge fan of it; it’s so quick and easy to make and so amazingly good! One of the things that I like about it is that you can easily add things, like vegetables, and I figured that it was past time to make a carbonara with my new favourite vegetable, cauliflower. Of course, I could not resist roasting the cauliflower to give it that caramelized flavour and I also brought cauliflowers best fried, mushrooms, to the roasting pan! Once the vegetables are roasted you really just need to cook the bacon (I used pancetta this time) and pasta and toss everything together! The trick to carbonara is that you want to mix the egg sauce with the hot pasta, bacon and pasta water so that the eggs ‘cook’ without scrambling, which is actually pretty easy! This roasted cauliflower and mushroom carbonara might just be my favourite carbonara yet! Check out below the recipe for some more carbonara pasta recipes! You really can’t go wrong with a creamy egg and bacon sauce! Roasted cauliflower and mushrooms are just so addictively good! Toss the cauliflower and mushrooms in the oil, salt and pepper, place on a baking sheet in a single layer and roast in a preheated 400F/200C oven until they start to caramelize, about 20-30 minutes, mixing half way through. Start cooking the pasta as directed on the package. Cook the pancetta in a pan, pour off all but a tablespoon of the grease from the pan, add the garlic, cook for 30 second and turn off the heat. Mix the egg, cheese, pepper and salt and parsley in a bowl. Mix the pasta, egg mixture, cauliflower and mushrooms into the pan with the pancetta, adding reserved pasta water as needed. Note: To speed things up, about 20 minutes into roasting the cauliflower and mushrooms, get your pot of water for the pasta on the stove and start bringing it to a boil. Option: Replace the parmigiano reggiano with pecorino romano. I want to dive right into this!!! Dinner is at your place, right? This looks incredibly scrumptious, Kevin! You have done it again. 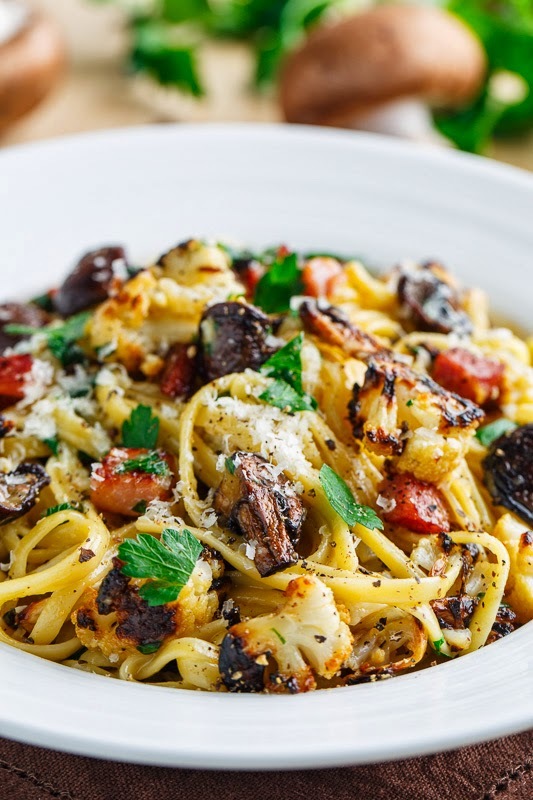 You had me at roasted cauliflower, pasta and Carbonara. I want this for breakfast right now! I LOVE carbonara! Glad to see you've added some healthy veggies in there. We don't eat meat so I am always on the lookout for good non meat dishes and if it is pasta, even better ! I am making this tonight for company coming to dinner 🙂 besos ! This is so perfect Kevin! Love it!! Amazing! I really like how you don't add cream to carbonara! Just egg and pork 🙂 And I can just imagine how the crunchy cauliflower and meaty mushrooms would be…deff making this! 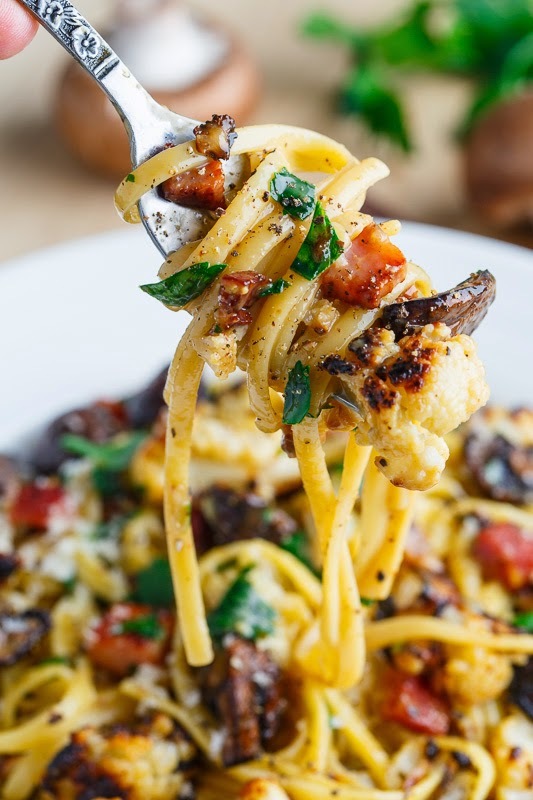 Love the addition of cauliflower to carbonara, what a tasty way to add the veggies! This pasta is perfect. It's really, really perfect! This pasta looks so good. I will be trying this recipe this weekend! What you think about tomato sauce? Will it be more better if I add some tomato sauce? Love this Kevin, sharing everywhere! This looks like the best version of carbonara ever! kneadwhine: This will work without the pancetta! I can barely handle how delicious this looks!!! I would devour this dish. I love how loaded up with veggies this is! Such a great pasta and your photos always make me drool! Kevin, I love this recipe! It looks so delicious and full of rich flavors. I definitely have to try this one soon…mmm, I'm getting hungry just thinking about it! Thanks! I'm making this tonight!!! I can't wait. Gorgeous. I have some cauliflower and mushrooms that I need to use up. This is so happening this weekend! Oh my goodness, you're totally killing me with this! So yummy! Love, love. love this!!! Looks amazing, Kevin! Anonymous: The eggs are placed into the sauce raw but the heat of the still piping hot pan, pasta and pasta water 'cooks' them. That is what I wasn’t familiar with. If the eggs were cooked. Wow. Awesome round up. Keeping this one round up real close by. You just can't go wrong with the slow cooker. Easy and convenient! Awesome!!! Raw eggs in pasta definitely makes the food really tasty! One thing I am confused about is about eggs. Put raw two eggs with cheese, etc. Then put them in the pasta.. Raw eggs in the pasta? Made this tonight..doubled the recipe for leftovers plus extra parsley, cauliflower, garlic & an extra egg (had to use the rest of my carton). Amazing! No side dish needed as the veggies were very prominent in the dish. My entire family loved it..including my 10 yr old and 8 yr old boys! Thank you for sharing. Really enjoy all of the recipes you post. Great job with this one. Wow, this looks amazing! I want to run out for ingredients immediately! Love your work!! Lovely recipe. So when u mix eggs , pasta , veggies and water up do u need to cook it ? Pasta should b hot ? aina: By that time everything but the sauce has been cooked and the heat from the pan, veggies, and piping hot pasta and pasta water will 'cook' the eggs in the sauce. Amy: A pinch or so of salt should be enough or you can omit it and allow every one to use salt at the table as desired. The dish is supposed to have a peppery flavour so if you like fresh cracked black pepper go for a teaspoon or more and if not cut back. I might omit the parsley if not using fresh but you can use the dried and I would cut back to 1/4 teaspoon. made this last night and i can't stop thinking about it…. so happy i made a double portion so we can have it again tonight! Made this dish tonight and it was wonderful! Next time I'm going to add MORE pepper and maybe some cherry tomatoes. TY! I just made this. It is awesome! Simple to make and full of flavor. Thanks for upping my carbonara game. Your picture looks so lovely! My husband and I love this dish. He hates mushrooms so i just keep them separate and add them to my dish. I add lots of garlic too. Love that there is no cream. Thank you for a wonderful dish! so good and easy! My husband is relatively picky and he asked to add this to the recipe book. I used prosciutto instead and just sauteed with the garlic a few minutes. It turned out great. Thank you! I'd have never thought about adding vegetables to a carbonara! 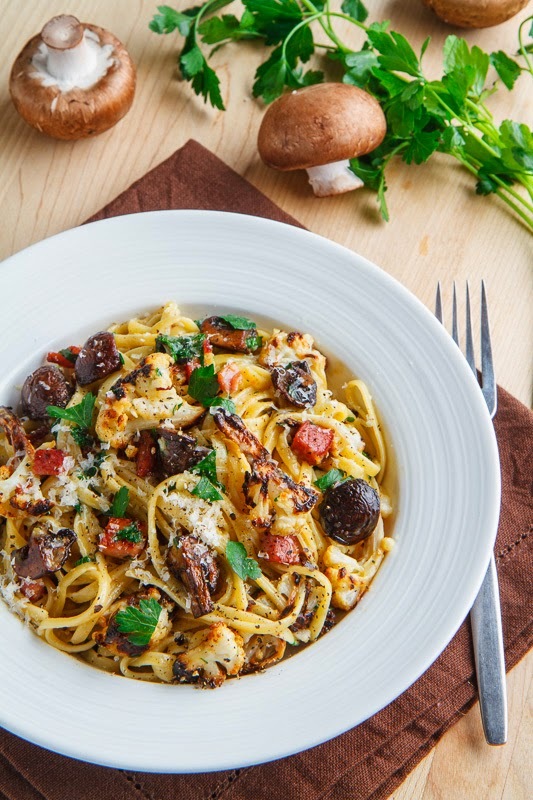 But mushrooms plus pasta are always a good combination – I think I'll have to try this recipe out. So does the egg really get fully cooked with only the heat of the cooked pasta and veggies? I am not a huge fan of undercooked eggs so I just want to be sure…. 🙂 It does look good though! Karen Barnes: The egg should 'cook' enough to make it safe but it is not guaranteed. If you are concerned then you might want to avoid this recipe. You could also replace the egg yolks with heavy/whipping cream as an alternative. 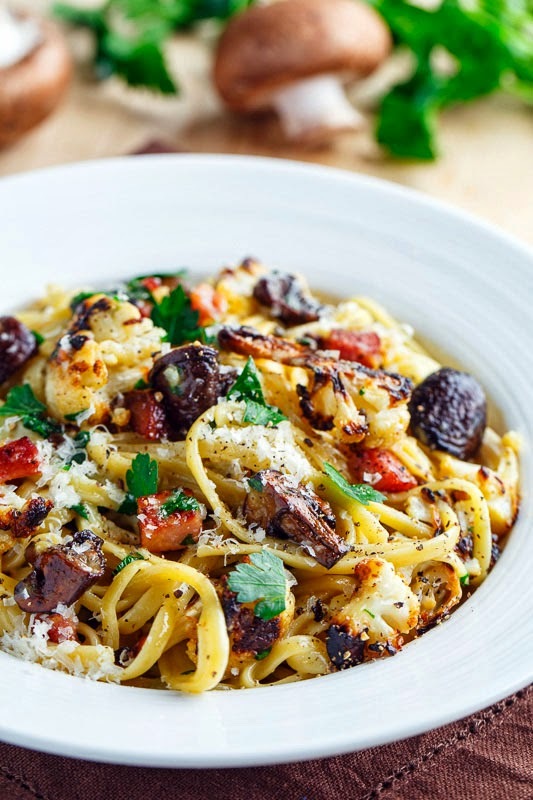 Looks incredible – roasted vegetables and pasta are such a great combination! Bill thewoksoflife: I love roasting vegetables! I love roasted cauliflower!! Roasted veggies and carbonara!!! looks so tempting! Can't wait to try it! Excellent recipe. I made it last night for company. Everyone loved it. I loved that it did not have cream in it, but the egg and cheese combo made it tasted creamy. My only suggestion would be to double the mushrooms (just because I like lots). I used 8oz. of white button mushrooms & 8oz. baby portabella mushrooms. And, I added 1 cup of the water from the pasta at the end to bring it all to a creamy goodness. This recipe is a keeper. Give it a try. You won't be sorry. what a great idea to add roasted cauli! Amanda Tarrant: Veggie noodles would be nice but as you mentioned you would have to change some things for the sauce. Potato or sweet potato noodles would be nice for the starch and a lot of veggie noodles will release extra liquid making the sauce less thick, creamy and clingy. You could continue to cook the veggie noodles and sauce in the pan over medium-low heat while mixing to cook the eggs without scrambling them. Another option is to replace the 2 eggs with 1/2 cup heavy/whipping cream and you can reduce the cream to thicken it and compensate for the extra moisture from the veggie noodles. I have made this several times. I just wanted to tell you how much I love it. Thanks for such a great recipe! Judy Goldin: You could simply omit the bacon or replace it with something like sliced sun dried tomatoes! Kevin, I want to say thank you for sharing this recipe! I made it today for my 81 yo mom and we both loved it. Kevin- I made this last night and it was wonderful! I really liked it but more surprising- my husband did too! He's really not a picky eater but hesitates when something fixed in a "unconventional" manner. There was nothing left on his plate. Fabulous recipe Kevin! I am going to try it. Looks beautiful plated. I hope I can get a response this late! This has been a go-to for me but my daughter has just been diagnosed dairy free (and gf). Do you think the sauce will work if you leave off the parm? Maybe adding extra garlic? Extra garlic would be good! I have not tried it but ‘nutritional yeast’ is a common substitute for parmesan cheese and it might work.